With the letters MBA now on his resume, he's ready to reach the heights as an executive, entrepreneur or something equally exciting. Give him a hearty pat on the back and the African American male MBA business school graduation personalized ornament to let him know how proud you are. One of many African American ornaments we have for graduation, this one can be personalized with his name and the year he achieves this milestone before it is tucked into our custom velvet pouch. 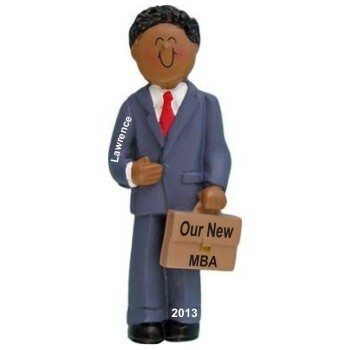 Give him an ornament that will encourage him to take his career to the next level - the male MBA African American graduate ornament from Russell Rhodes.